UPDATE August 2018: myassignmenthelp review includes many new updates such as new testimonials from our customers and assessment of their new webpage. Assessment of their old site can be seen after the assessment of their new site. Disclaimer: While this post does seems like we at inkmypapers are putting down a fellow competitor, I can assure you that it is not. You can see our favourable review of another competitor UKessays. As a fellow student myself, I am cheated way too many times by assignment help services that I just want to make sure that other students are not scammed and cheated by these services as well. If you are looking for an assignment helper or essay writing services, there is a high chance that you may have come across this website through Google. The above statements are just some of the claims they made on their website. So, are they for real? The feedback is mostly about their quality of work and as you can see, it doesn’t seem to be good enough. Despite these feedback, we cannot vouch for all of their work. There may be quality work done by them as well, but if I were you, I will be a little more cautious about ordering from myassignmenthelp. More than just review that we’ve collected from their old customers, a simple search for reviews on MyAssignmentHelp has led me to this interesting online forum called EssayScam. In this particular forum thread, there are a few users complaining about their essay quality and punctuality. As you can see, these are some really negative comments. However, these comments are from 2012 so they may have improved since then. On their website, they claim to have 4500+ PhD Experts, or specifically 4,986 of them. While we have no concrete evidence to disprove that they have 4,986 (neither do they have evidence to prove that they do INDEED have them), I am highly doubtful that there are that many PhD Experts that are willing to provide assignment help services. For our service at inkmypapers, in the years (since 2009) that we have been operating, we have never receive any applications from PhD (none at all!) for our writer’s position. So we are highly doubtful that any service can hire that many PhD writers. Also, for the price that they are charging for essay writing, these PhD writers are either severely underpaid, or graduated from some 3rd world country that can accept such low pay. And as you dig deeper into their site, things get even more worrying. On one of their webpage, myassignmenthelp has showed us the profile of a few of their “experts”. A reverse search of these “experts” on google reveals that they are not who they are. Here’s one search on “Kimberley Chen” (as shown in picture above) who supposedly is a MPA in Accounting and has completed 2,115 orders. The search shows that this picture of “Kimberly Chen” has been used for various other profiles such as “Deena Maleb” and “Adlina Han”. When a reverse search shows results like this, it usually means that the photo is a stock photo, used by myassignmenthelp to create the fake profile of Kimberly Chen. There are several testimonials provided on their site as well. There are several suspicious points about the testimonials. Firstly, I am highly doubtful that students who have used assignment help services are willing to provide their full name and even a photo (!) for the testimonials. Testimonials that we have collected for our website are always censored so that our customers’ privacy can be protected, and we showed the entire WhatsApp conversation to maintain its authenticity. From the above testimonials, it seems that anyone can just type it out and put it on their website. Secondly, those photos seem very much like stock photos to me. I cannot be sure though. So, is MyAssignmentHelp a scam? While the evidences presented here on this post says a big YES, I want you to be the judge. Go and browse through their homepage and their Singapore page. Also google for ‘myassignmenthelp’ and you may find other related reviews on them. If you’d like to see more review of their services, the below is our review of their old website. You can see a copy of their older site here. 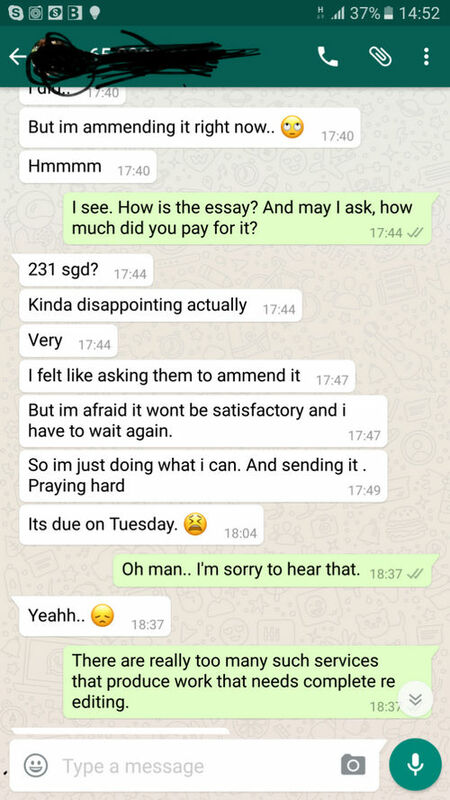 Screenshot from MyAssignmentHelp Singapore page. A quick look at the locations that the ‘Experts’ are from immediately raise suspicious. As a Singaporean myself, I have never seen anyone misspelled Tampines as Tempines. Even if it’s a typo, the letter E is not even near the letter A. Also, grouping the country Singapore with the places in Singapore such as Hougang and Yishun is weird. Shouldn’t they all be places in Singapore instead? Nonetheless, I decided to dig deeper. The Live Chat button on the website provides me with the perfect opportunity. To be fair, it took them less than 20 seconds to reply to my message at 4am on a Friday night/Saturday Morning. And here’s what she replied. Again, to be fair to them, not correcting my blatantly misspelled words may be a form of politeness. I wouldn’t correct a customer who uses dateline instead of deadline as well. That’s just rude and arrogant. Still, I have a strong feeling that Chloe (that’s supposedly her name) doesn’t really know her Tempenes and Tempines from Tampines, let alone Paris sis and Pasir Ris. They promised Expert Help from their PH.D. writers but a thorough read through of their Singapore page reveals several glaring grammatical errors. There are many such errors from other parts of their website but I believe this small section is enough to showcase it. 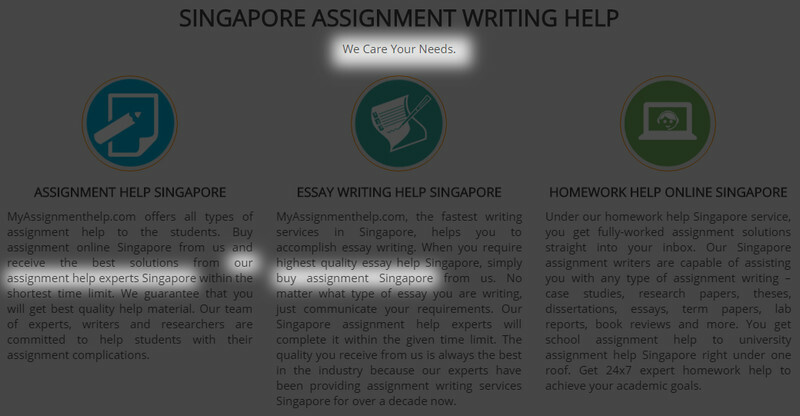 I wouldn’t trust an essay writing service that wrote ‘We Care Your Needs’ instead of ‘We Care For Your Needs’.